So, here we are. We are just a few days shy of witnessing a long-lived rivalry between India and Pakistan. Unquestionably, the India-Pakistan encounter will turnout out to be the greatest encounter of the tournament unless and until they both meet again in the Super Four stage or Final. Virat Kohli has been rested, and the onus will be on Rohit Sharma to lead India to yet another Asia Cup title. Meanwhile, Pakistan will fancy their chances in the Asia Cup with India sans Virat Kohli. Expected Crowd Turnout: With an India-Pakistan encounter on the cards, it is expected to be a jam-packed affair with a total crowd turnout of 24,700. With the India-Pakistan clash to be an afternoon affair, the temperature will be clocking around 40 degree Celsius. Meanwhile, the humidity levels will be as high as 40 per cent mark. With minimal cloud cover, the rain is not expected to be the villain. Thus, it is expected to be a pleasant but hot evening in Dubai on the D-Day. Giving a quick view on the history, the pitch at Dubai International Cricket Stadium has been on a slower side. Besides, the pitch has been quite flat which might help the spinners as the game progresses. Dew might play a decisive role as well which again counters the effective use of spinners in the latter part of the match. Everything will boil down to the humidity levels at that moment. 73 - 52 in favour of Pakistan. Till date, India and Pakistan have met each other on 129 occasions in ODIs. 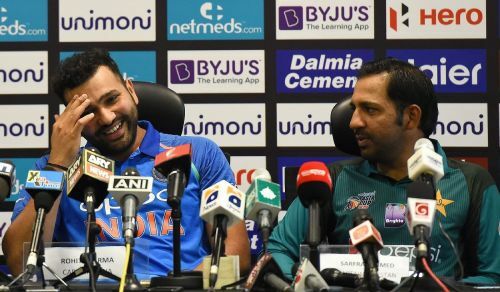 Out of these 129 meetings, India has been victorious on 52 occasions while Pakistan on 73 occasions with four matches ending without a result being produced. Rohit Sharma (C), Shikhar Dhawan, Lokesh Rahul, Ambati Rayudu, Manish Pandey, Kedar Jadhav, MS Dhoni (WK), Dinesh Karthik, Hardik Pandya, Kuldeep Yadav, Yuzvendra Chahal, Axar Patel, Bhuvneshwar Kumar, Jasprit Bumrah, Shardul Thakur, and K Khaleel Ahmed. Fakhar Zaman, Imam-ul-Haq, Babar Azam, Shan Masood, Sarfraz Ahmed(C & WK), Shoaib Malik, Haris Sohail, Shadab Khan, Mohammad Nawaz, Faheem Ashraf, Hasan Ali, Junaid Khan, Usman Khan, Shaheen Afridi, Asif Ali, and Mohammad Amir. 2 - Kuldeep Yadav requires two more wickets to complete 50 ODI wickets. Grabbing these wickets he will become the second fastest Indian to reach 50 ODI wickets. 5 - Yuzvendra Chahal is just five wickets short of 50 ODI wickets. 10 - Indian veteran Bhuvneshwar Kumar needs just ten wickets to complete 100 ODI wickets. Scalping these wickets Kumar will become the 19th Indian to reach 100 ODI wickets. 27 - Babar Azam needs to score 27 more runs to go past the 2000-run mark in ODIs.